I know that animals can't make poly-unsaturated fatty acids (PUFA) and so require them from dietary sources. For eg.Omega -3 and Omega 6 fatty acids. My questions : Can animals synthesize other unsaturated fatty acids from scratch? If not, does the unsaturated fatty acids in the phospholipids of plasma membrane of animals come only from dietary sources? Yes, animals can make their own unsaturated fatty acids. Mammalian fatty acyl desaturases can introduce double bonds at the Δ5, Δ6 and Δ9 positions (i.e. numbering from the functional group). As shown in the diagram below, this means that we cannot introduce double bonds at the ω3 or ω6 positions (i.e. numbering from the methyl end of the molecule) in fatty acids of a reasonable length (see any Biochemistry textbook for confirmation). I've illustrated the impossibility of us making α-linolenic acid as an example. Only linoleic acid ($\omega 6$) and $\alpha$-linolenic acid ($\omega 3$) are essential. Other PUFAs are synthesized from these by desaturases (as Alan Boyd pointed out). I haven't come across any study that reports de-novo synthesis of $\alpha$-linolenic acid in animals. However, this study reports that mites can synthesize linoleic acid. Not the answer you're looking for? Browse other questions tagged metabolism lipids or ask your own question. Why are mammals unable to produce Essential Fatty Acids? 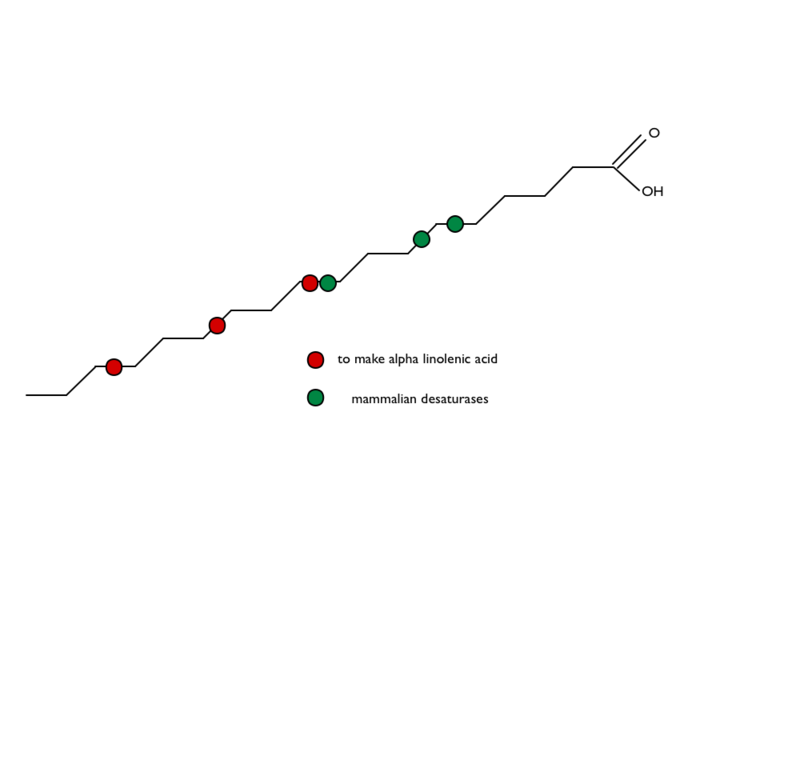 Where do transamination and deamination take place?